Today I was asked to pray for someone's dog, "Halo", this poor dog had a stroke this week and as a result, she was unable to walk properly or move the muscles on the left hand side of her face. So as we prayed for her, I witnessed her eyeballs welling up, which shocked me, because I don’t ever remember seeing a dog’s eye’s well up like crying before. Then all of a sudden she started to blink both her eyelids, of which she couldn’t move the left one at all, until after praying for her, and after some comforting, we let her out of the front of the house to try to walk, and she not only managed to walk without limping, but she was getting up and down the porch steps as if perfectly well. How awesome is God. Below is another testimony being shared during the FGB meeting in KL, Malaysia, from a guy I'd previously prayed for, he received by faith, and went straight home to pray for his sick dog. ​We invited Kev to minister at our Speakers of Life meeting. He began by giving us a host of stories on how Holy Spirit led him to see healings and deliverances. During the meeting everyone started to smell burning, I had to go and check outside to see if anything was on fire, but the aroma of burning was just in our meeting room! I took Kev to Byker City Fellowship International in Newcastle once, and during the worship the Pastor came up to me and asked me to take Kev over to his daughter who had a hip problem that was stopping her from running, throughout this ministry time I shadowed Kev and witnessed first hand how he ministered in the Holy Spirit and imparted gifts. So the pastor’s daughter stood before us and Kev ministered to her hip and we saw her leg kick out, and she confirmed that she had been healed, at the same time Kev said she had a prophetic gift that she needed to allow the Holy Spirit to bring out. So immediately after she was healed, he took her with us to the next person who requested prayer. Kevin recognised that this man had an unclean spirit and asked the pastor’s daughter for name that God had given to her while he was praying for the man. She gave Kev the name of the unclean spirit, and when Kev named and commanded it to come out, the man started convulsing as the unclean spirit manifested! Another woman I took Kev to had a bone marrow problem but after short time Kev said it was a water spirit, and as he rebuked it she too started convulsing as the unclean spirit started manifesting, so much that she was rolling all over the floor before it eventually left her as she coughed out and she became healed. 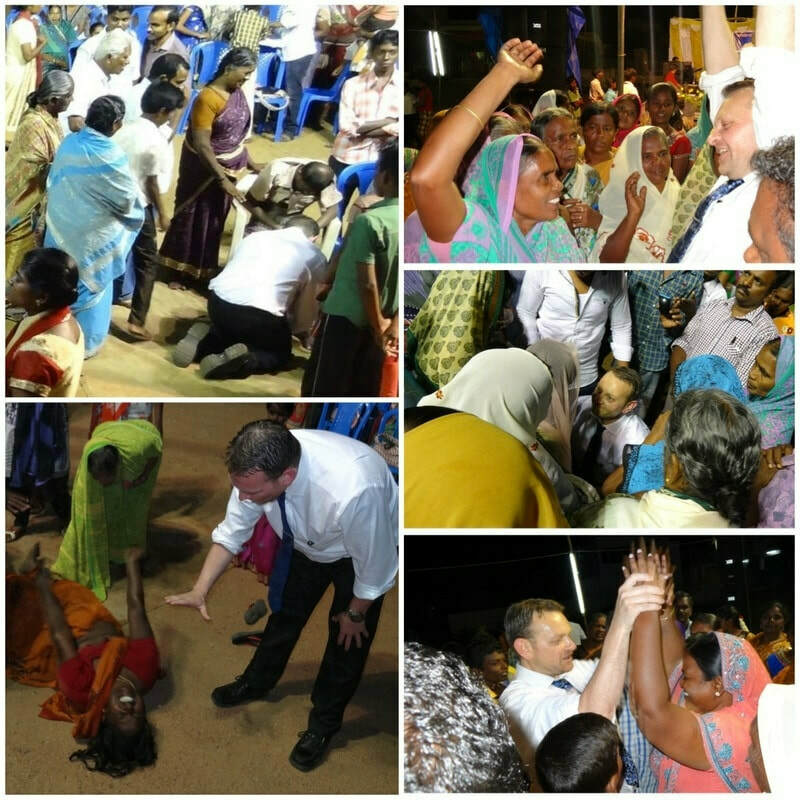 Now I was beginning to see how the Holy Spirit operated, and Kevin was so moving in confidence that each person would be healed, I heard his prayer/ rebuke, he never asked for demons to go but demanded, while treating each person with dignity who he ministered to, I was so glad to be a part of what was happening. Another request came from a man who had pain across his shoulders and was deaf his in left ear, Kev rebuked a spirit of false responsibility in Jesus name, and the man confirmed that his ear and shoulders was healed. The requests were coming in a steady stream, one woman said she had a frozen shoulder, but then revealed some years previously she had an accident that damaged a bone, Kev told her that the pain would travel down her arm and when it reaches her wrist, she must shake of the devil and as he prayed she confirmed that her pain did exactly that! Kev said, “Give it a good shake!” And as she did, she confirmed the pain had gone and her shoulder was healed. Kev prayed for the Pastors wife, who had a slight pain and deafness in her left ear, He rebuked the pain and demanded all negative words to depart before blowing a light breath into her left ear, proclaiming life and then she was healed! I was totally in awe of how the Holy Spirit was working bringing healing and deliverance through Kev, he would say later on that we were all qualified to bring healing, deliverance and raising the dead, Jesus paid the price so we could do so. Another woman request prayer for a stiff neck and pain across shoulders, Kev rebuked the pain and asked her to move her neck. The lady started moving her head around, then moved her shoulders and as she loosened up she began to dance with her head bobbing along to the music and then Kev held her hands and they both danced together, then she declared that she was completely healed. I was also taken how Kev would minister gifts to people, a man requested prayer for lower back pain from weight training in the gym. Kev said that God was going to give him the gift of evangelism, then Kev pressed his hand on the mans stomach and the man could feel something enter him! Then Kev told him that he was going to birth evangelism! It brought a smile to his face and he was healed. This was a tremendous time, I was moving alongside this brother in Christ and watching how he ministered, he was telling me at times what to look for and I asked him how he got to know what the problem was and he would tell /show me. This man came and said that he’d had a bike accident some years ago and left his right knee painful, Kev placed his hands on his knee and then I heard the bones crack, he then asked him to flex his knee and he declared that he was totally healed. After each healing and deliverance Kev encouraged the person to lift up there hands to heaven to praise and thank Jesus for His glory. The ministry time now over, I got home rejoicing for I had seen many healings, a few deliverances, I had been shown how to do the same, and the one comment that Kev Dexter always reiterated, that there was no special person marked out to do this ministry, but we all were qualified by the blood of Jesus to do it. It was about seeking a more intimate relationship with Jesus and allowing Him to work through us to bring the Kingdom healing to a hurting world. I have made life long friends with Kev, I only wish I’d met him earlier in my Christian walk. 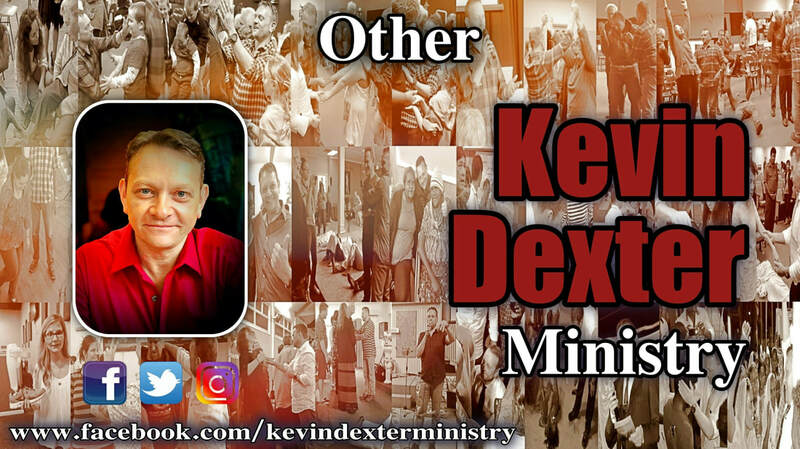 While ministering with John Scotland, Kathie Walters and Godfrey Birtill, at a conference in Florida U.S, as I was praying for people, I witnessed God do some amazing miracles, but one in particular really stretched my faith. A lady came up to me and asked for prayer for her ankle, saying that she had no movement in it. I knelt down and placed my hand upon her ankle and, to my surprise, it felt like I’d put my hand on a solid square chair leg. It felt like a piece of inch and a half angle iron! I asked the lady, “Is this your normal ankle?” And then she replied that she’d previously had an operation on it and had a piece of metal grafted to her bone, which explained a lot! This was the reason why she had no movement. Well, I believe in miracles but I was trying to reason in my head, how could it be possible? Was God going to bend the metal or make a brand new ankle? I started to pray, and about half way through my sentence I heard a loud cracking noise and, as I glanced up, I witnessed the shock on everyone else’s face as they had heard it too. I was invited by Eastwood community church to share at an evangelistic coffee morning in Eastwood town centre, with the hope of reaching out to non-Christians, with whom I shared my testimony and stories about hearing God. So afterwards, some people came forward for prayer. The first was a Christian man in a wheelchair – no pressure – so I laid my hands on him and closed my eyes and, with so many people waiting and watching expectantly, I so wanted to say to the man, “Get up and walk!” But that was coming out of my natural thinking; I assumed that was what he wanted prayer for. In my mind, I said to God, "I'm not telling him to get up and walk unless that’s what You want me to do." And at that moment, the Holy Spirit gave me a picture of the man having his chest filled with the Holy Spirit, so by faith, that's exactly what I prayed. When I'd finished praying, the man said to me, "You thought I wanted to get out of this wheelchair, didn't you? But what I really wanted was more of God, and when you prayed, I saw Jesus standing there with a watering can, pouring the Spirit into my chest" – exactly what the Spirit told me to pray! After I’d finishing preaching at an Iranian Church in Derby, I asked if anyone wanted any prayer, to which there was only one person in the room who came forward, so when I asked him what he wanted prayer for he said that he’d received some prayer the previous weekend for pains in his back but that it was only 99% healed. Just great, I’d sat through 8 songs of Iranian worship and spoken all that through an interpreter and the only person who wanted any prayer, was a guy just needing 1%! You have to laugh! So I gently placed my hand upon his back and prayed and he went completely out in the Holy Spirit, leapt up off the floor and started shouting and declaring that he was completely healed! Halleluiah! Although I have to say that I wasn’t expecting his healing to be so dramatic.